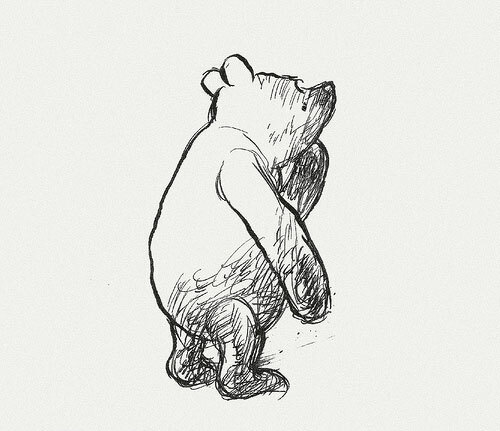 This is Winnie the Pooh as we remember him from childhood: a sweet illustration by E.H. Shepard, from the children's books by A.A. Milne. There is an interesting story behind this bear. British poet and playwright A.A. Milne worked for years at Punch magazine. In 1924 he published a collection of children's poems called When We Were Very Young. They featured a poem about an unnamed teddy bear with the description: "however hard he tries grows tubby without exercise." The book was illustrated by E.H. Shepard. A.A. Milne had a young son named Christopher Robin. Christopher Robin had a collection of stuffed toys that he loved. His favorite was a bear named Winnie. Christopher Robin's stuffed bear Winnie was named for a famous bear at the London Zoo. 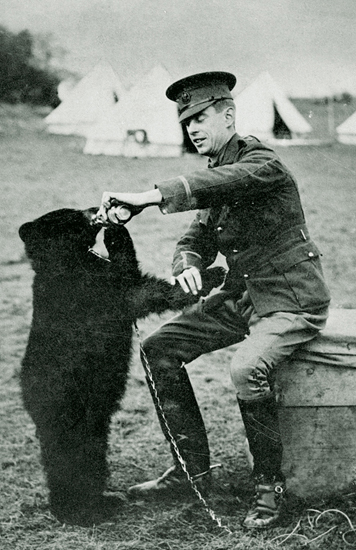 The real Winnie was a female bear, saved from hunters in the Canadian wilderness by Lieutenant Harry Colbourne and donated to the London Zoo. Christopher Robin visited the zoo many times, and even had a special birthday party there. In 1926, Winnie the Pooh was first published. Pooh was added to Winnie's name: "But his arms were so stiff ... they stayed up straight in the air for more than a week, and whenever a fly came and settled on his nose he had to blow it off. And I think – but I am not sure – that that is why he is always called Pooh." I loved these books, and the charming illustrations, as a child. Do you remember Winnie the Pooh? I'd love to hear your memories in the comments, below. My Grandma was a children's librarian and Winnie the Pooh was probably her favorite character. She instilled this love in all 32 of her grandchildren. I absolutely loved Winnie the Pooh! I knew some of these things about Winnie, but I also learned some things! It's fun knowing the history of your favorite characters. Winnie the Pooh was one of my absolute favorites as a kid. Now as a children's librarian I love sharing his stories with children. Thanks for stopping by! Nicole, how neat that your grandmother was a children's librarian, and Becky, neat that you are a children's librarian as well. That would be my dream job! Lisa, that is so neat! I would have enjoyed that as a teen too.